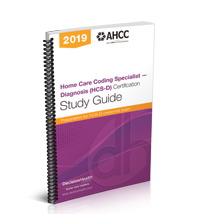 The Home Care Coding Specialist – Diagnosis (HCS-D) ICD-10-CM Certification Study Guide, 2019 is the go-to prep resource for the HCS-D ICD-10-CM certification examination, offered by the Board of Medical Specialty Coding & Compliance (BMSC). 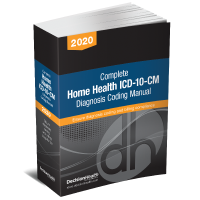 The Home Care Coding Specialist – Diagnosis (HCS-D) ICD-10-CM Certification Study Guide, 2019 will help prepare you to take the Home Care Coding Specialist-Diagnosis (HCS-D) ICD-10-CM certification examination, offered by the Board of Medical Specialty Coding & Compliance (BMSC). You’ll get tips and sample test questions authored by BMSC Board members. Updated with 2019 new codes and coding guidelines and conventions that will be covered on the exam! Most up-to-date Ethical and Legal Standards for coding professionals. Questions for the Expert – Coders have asked our experts about common coding problems. Our experts provide answers and feedback that can guide you on the test. Exam Outline – See the concepts that will be tested on your home care coding exam, and make sure you’re familiar with all of the topics outlined. Coding tips – You get valuable clues to the exam questions. Practice questions – Test yourself by applying what you’ve learned in practice scenarios.